When I bought my first-ever Apple computer in 2016 -- a MacBook Pro with touchbar -- I was a bit nervous about the lack of ports. While on the go, I am pretty much fine with only having USB-C, but when home, I like to connect my laptops to a monitor, keyboard, mouse, and hardwired Ethernet. In other words, I make my notebooks serve double-duty as makeshift desktops too. I would need to leverage dongle/adapters to meet my needs. Thankfully, the MacBook Pro USB-C ports are also Thunderbolt 3, meaning the laptop is compatible with high-end docking stations. Yes, there are normal USB-C docks on the market too, but the Thunderbolt 3 models are far superior -- they can have more ports and provide better quality video to monitors. Since they are pricey, selecting the best model can be daunting. Luckily, after much testing, I am confident to say I have found one worth your hard-earned money -- StarTech Thunderbolt 3 Dual-4K Docking Station with SD Card Slot. The name of the product tells you a lot about it. It can push two 4K monitors, and it has a full-sized SD card slot. It is important these two features are mentioned prominently in the product name, because many docks don't offer dual 4K or SD card support. The front of the docking station features the full-size SD card slot, 3.5mm audio jack, and a powered USB 3.0 Type-A port. While I love the placement of the card reader and USB port, I am not thrilled with the audio port being on the front. If you use headphones or a headset, it might make sense, but not if you use wired speakers. In my case, I use speakers, so I have an ugly cable running from the front to them. I would prefer it to be on the rear, but it's not the the end of the world. A cheap USB audio adapter, such as this one, solves the issue. On the rear, there are four USB 3.0 Type-A ports. This is great for me, as I prefer wired peripherals. For example, my keyboard and mouse will take up two of them. The other two? A USB webcam and an external hard drive. There is also a USB-C port on the rear, which can be used with a Type-A dongle, such as this one, if you need a fifth such port back there. A Gigabit Ethernet port is also found on the back, which is a must for hardwired networking. Look, I get it, Wi-Fi can be very fast and reliable these days, but wired still reigns supreme -- try to use it if you can. I appreciate the option being there, but understandably, many consumers won't use it. Also on the rear are two more USB-C ports, which are actually Thunderbolt 3. One connects to the laptop, which makes the dock function, plus charges the computer too -- up to 85 watts. This leaves one usable Thunderbolt 3 port. That port can be used for connecting accessories and devices, but also, it serves as the second display output. You see, there is just one DisplayPort -- to connect two monitors, you would use the included dongle. For my testing, I used a MacBook Pro and Windows 10 laptop extensively with it. I did my normal computing tasks -- writing, video editing, media consumption, etc. While I don't have two 4K displays for testing, I can confirm that it can push one at 60Hz without issue. I have no reason to think there will be any issue with two 4K displays, as the company claims. Believe it or not, it can also push a 5K monitor -- if you have such a beast. My biggest concern was reliability. In my experience, Thunderbolt 3 docks can be very flaky. Some common problems are trouble waking the MacBook Pro from sleep, USB hard drive disconnects, and video glitches. Thankfully, the StarTech Thunderbolt 3 Dual-4K Docking Station with SD Card Slot has proven flawless. Not once did it perform less than perfectly -- no glitches or oddities. The SD card slot is both fast and reliable, making transferring video and image files from my camera to the computer a treat. I appreciate not having to connect a dedicated SD card reader -- I can leave my mobile reader in my bag, reducing the possibility of me forgetting it at home. Sadly, there is no dedicated micro SD slot, but an adapter can be used, of course. Despite my desire to have the 3.5mm audio jack on the rear rather than the front, it still performs wonderfully. It essentially serves as a USB DAC, providing what should be superior quality to the dedicated port on the MacBook Pro. With that said, I noticed no difference between the two. Ultimately, whether using the StarTech Thunderbolt 3 Dual-4K Docking Station with SD Card Slot with macOS or Windows, it performed wonderfully. The dock's aluminum body feels extremely premium, but also, it looks damn beautiful too. 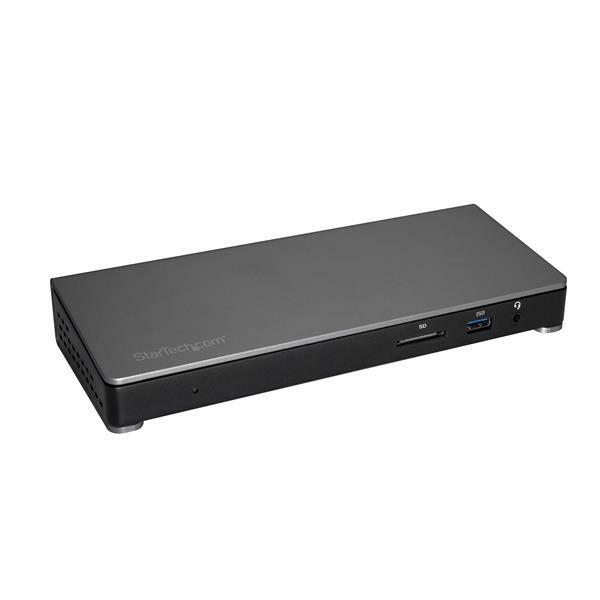 If you are the owner of a Thunderbolt 3 laptop, and you want to use it as a desktop, this is the docking station to get -- perfect for both offices and dorm rooms. It is highly recommended. It can be had from Amazon here for $299.99. Please note: It is only sold in "space gray" color.